22nd November 2017, New Delhi: The GST Council last week announced that meals at restaurants (both air conditioned and non-air-conditioned) will now attract only 5% GST, which is much lower than the 18% that earlier applied to air-conditioned restaurants. But the story is not as sweet as it sounds. 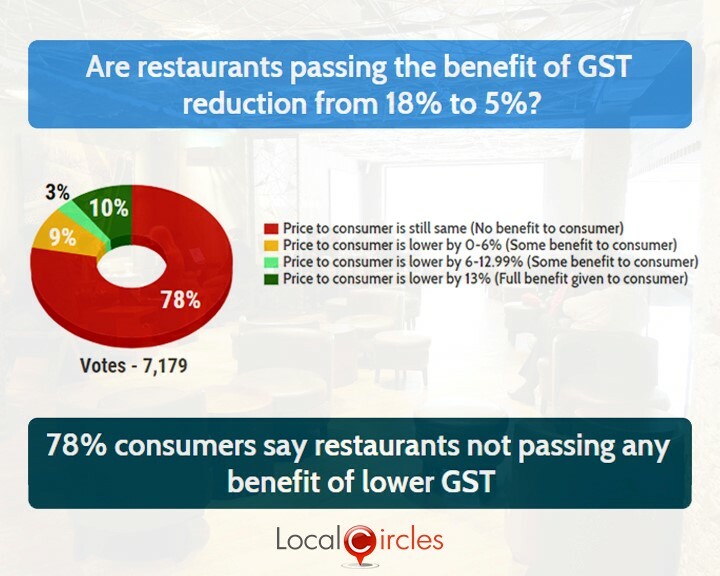 LocalCircles conducted a survey to check if the restaurants are passing on the reduced GST benefit to the consumers. On the question if restaurants are passing the benefits of GST reduction from 18% to 5% to consumers, 78% respondents said that the restaurants are not passing any benefit forward and the price to consumer is still the same. 9% said price had gone down by up to 6% and 3% said price had on down by 6-12.99%. Only 10% said that the full benefit was being passed on to the consumer and he prices had gone down by 13%. 7,179 people voted on this poll. While the lower tax rate has become effective from Nov 15, many consumers in the last 3 days have shared various bills where the restaurants instead of passing the lower GST benefit to consumers are instead increasing base prices and keeping the price for consumer the same. In addition to many small restaurants, complaints have been received in the various circles about multi-nationals like McDonalds and Starbucks. Consumers are demanding that some action is taken to ensure that these benefits are passed on to the consumer in form of reduced bills. The government has taken this step to boost consumer demand but according to National Restaurants Association of India (NRAI) the going away of input tax credit will increase their cost by 6-7%. That still means that food prices at restaurants should drop by 6-7% unless obviously the restaurants decide to boost their profits.